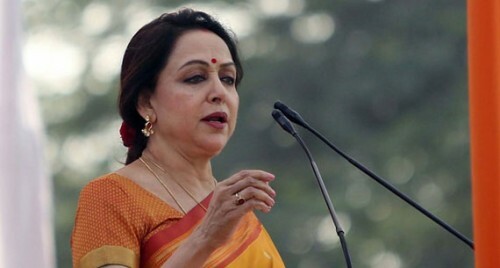 Mathura (Uttar Pradesh), April 16 (IANS) This Lok Sabha battle is "different" for BJP MP and Bollywood actor Hema Malini because of the SP-BSP-RLD alliance but she is confident it won't affect her much because of her work over the past five years. And of course Mathura's voters, who she said are not trapped by issues of caste unlike in the past, will bear in mind the performance of Prime Minister Narendra Modi when they vote. "I don't think that the (opposition) alliance can be effective because people see the work done by the candidate. I do not underestimate any party. But I am confident of the work I have done. I did things which were not done in the last 60 years," Hema Malini told IANS. Speaking at her residence in Omaxe Intercity in Mathura, the MP said the opposition was harping on caste identity. "This is a Jat dominated area but caste is not a factor for me. I am here to serve Brij, to serve Lord Krishna and people residing here. I have done work for everyone because all are Brijwasi. People of different castes want Modi." Although the contest this time would be "different compared to the last election", she insisted that a "Modi wave is still there. This time, the development he has done for the country is the main issue. "That is the main thing. Those are the main issues people are talking about. People are happy." Hema Malini, whose election campaign got a boost when her actor-husband Dharmendra campaigned for her, insisted that she herself had done a lot of work in the past five years. "I have done so much work in Mathura. I am proud of the works. I am confident of winning the election on the basis of what I have done. I have done so much work which the previous MPs were not able to do." Hema Malini said things had become easier for her because both the Uttar Pradesh and the central governments were controlled by the BJP. "So it is more easier for me." The MP said that as this was a religious place, her focus was on developing Mathura while preserve its ancient heritage. "We have to maintain the Krishnasthali (place of Lord Krishna). There are many places where Lord Krishna did many things but these have been lost." On opposition's criticism that she posed with farmers more for a photo opportunity, she said: "Do you think that I never went to the fields in the last five year? That time no one was there to click photos. "This is not the first time I sat on a tractor. But media people now want me to pose and as a film star I do it for them. And it becomes a big news. What is wrong in that?" On RLD candidate Narendra Singh's claim that the electoral contest was a fight between "Brijwasi vs outsider", Hema Malini asserted that she was not an outsider and that she too had a house here. "What has Narendra Singh done so far for the people as a Brijwasi? They have done nothing. Being a Brijwasi is not the only thing. One should have feelings in the heart to do things for the people." Has she been visiting Mathura regularly? "Saying that I should not go Mumbai is wrong. I also have a house there. I am an actress. My family is there. Why should I be here all the time? I have to spend time there too. Whenever I am required, I have been here. And I do many things for Mathura people by sitting in Mumbai. "There are several congested areas here which I am trying to rectify. So many roads in Mathura have been widened and places are being made neat and clean." Hema Malini in 2014 defeated RLD MP Jayant Chaudhary by 3.30 lakh votes.